By: Courtesy of the National Association of Colleges and Employers. Your next interview may not be face-to-face—it could be through Skype, Google Hangout, Facetime, or a webcam. According to one recent survey, 55 percent of employers have used video interviewing as a college recruiting tool and more and more employers are recognizing video as a useful interviewing tool. Getting ready for your video interview isn’t hard, but there are specific steps you can take to ensure you interview at your very best. The good news is: Everything you do for an in-person interview is needed for your video interview. Research the company. Practice answering potential questions. Have a list of questions you would like to ask. Dress professionally for the interview. Write a thank-you note after the interview. Check first with your university’s career center. It may be set up for video interviews. Plus, staff there can help you practice—and practice is key to a successful interview. If you are doing the video interview on your own, be sure to practice. If you are handling the video interview on your own, choose the device you’re most comfortable using. You can use your computer, a tablet, or your smart phone. Test your equipment well in advance of the interview. On the day of the interview, make sure the battery is at full power and the camera lens is clean. Check your Internet connection. If you share a connection, you may want to ask others to stay off the Internet while you are interviewing. Be sure to check your connection an hour before the interview to ensure everything is working. And, have a backup plan in case something goes wrong. Choose a good location. You want a quiet place—no roommates, no pets, no distracting noises. You want a plain background (in front of a solid color wall is perfect) and you want your desk or table to be free of clutter. (You can have your notes, your resume, and paper to take notes.) You want the room to be well-lit so that the interviewer can see you clearly. Use diffused lighting—nothing harsh or direct so that you won’t have shadows or glare. Position your camera so that it is level with your head or angled just slightly downward (you don’t want the camera looking up your nose). The camera should be far enough away that it captures you from the waist up. Now that you’re ready, do a test interview. 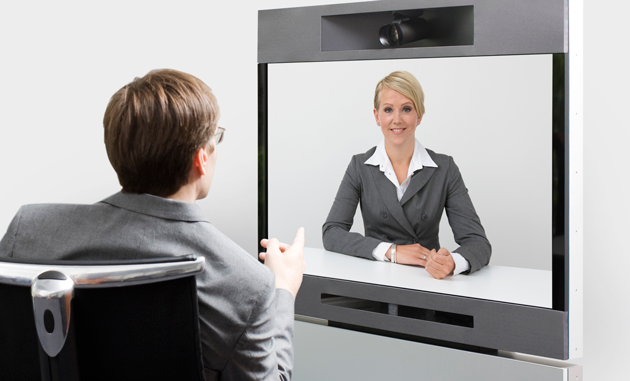 Ask a friend to help you practice your interview using the technology you’ve just set up. Fix any problems (sound, lighting, camera placement) now. If you can, record the interview so that you can review it and improve your performance. On the day of the interview, dress in your complete interview outfit. Do not just dress from the waist up: You may need to stand up during the interview, and don’t want to be wearing pajama bottoms. In addition, make sure your clothing doesn’t blend in with your background. Turn off all your apps prior to your interview. You don’t want distracting noises during the interview. When the connection between you and the interviewer opens, look directly at the camera, not the screen, so that you’re making good eye contact. Use positive body language. Smile and nod when appropriate. Keep your hands off your face. Speak in a conversational tone. Pause briefly—about three seconds—after each question before you respond so that you don’t talk over the interviewer. Nod at the interviewer to show you’ve heard the question. Use your notes if you need them, but remember that this is a conversation between you and the interviewer. Avoid looking down at your notes as much as possible. Once the interview is finished, thank the recruiter for the interview. Then, be sure the connection is closed before you do anything else. Finally, don’t forget to e-mail your thank-you note to the person who conducted the interview.